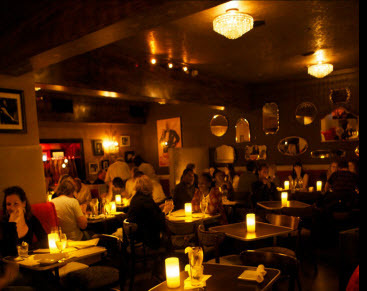 Over the years, many of us in the L.A. jazz community have been dismayed to witness the closure of some of our favorite venues, such as Donte’s and Shelly’s Manne-Hole. So we definitely have something to cheer about when a new club materializes on the scene. A few weeks ago when I caught the Red Hill Quartet’s recent gig (*), the group’s vibes player, Ricky Luther, told me about a new jazz club called Angels, located at the corner of Wilshire Blvd. and 25th Street in Santa Monica. Angels is an intimate piano bar and supper club featuring a different band six nights a week, and – here’s the kicker – there is no cover charge! The club features a broad spectrum of musical genres, including straight-ahead jazz, funk, blues and hip-hop. Angels has a full bar and an eclectic and reasonably priced menu. After the band had warmed up, the headliner, singer Sharon Marie Cline, stepped on stage. Sharon approaches her material with a deep appreciation of jazz history, delivering a variety of standards, show tunes and classic jazz ballads with a smooth, clear voice. She is very secure in her abilities and sings without resorting to the technical histrionics afflicting too many jazz singers these days. Sharon was supported by Jon Stuart, who provided crisp and punchy yet lyrical support on drums; Adrian Rosen on bass, laying down a rock-of-Gibraltar bottom with a terrific, warm sound; and on keyboards, Rich Eames demonstrated why he has a reputation for having the biggest ears in the business, as he effortlessly navigated everything from ballads to blues, his prodigious technique clearly in evidence, yet never overwhelming the material. In case you weren’t paying attention, let me reiterate that Angels has no cover charge. And, judging by the great ambience and the exceptionally high quality of the music there, this may not last forever!